The spokesperson further shared, “We offer a remote control for KascoChangingColor-3RGB. This product comes in several cord lengths. We give a two-year warranty on it. Then, we have another product that is Kasco 6LED Light Kit, Stainless Steel. These are the best lights for Kasco J and VFX series fountains. These lights run on standard 60Hz power and are UL listed and CSA certified. These durable and flexible lights add nighttime drama and beauty to any water feature. Each kit comes standard with blue, amber, red and green lenses.” Fountain Mountain provides the best fountain lights that include Kasco Universal Stainless Steel, 4 Fixture LED light set. This is also an ultimate light set for most non-Kasco floating fountains. Each 19-watt, low-voltage fixture delivers a classic white color and is rated at nearly 1,700 lumens. 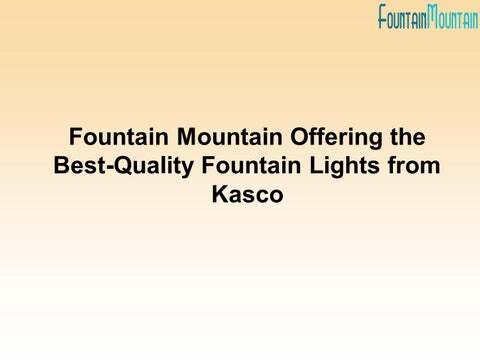 Some other types of fountain lights available at Fountain Mountain are the Kasco LED RGB Universal Fountain Light Kit, KascoLED4C11Universal, and KascoColorChanging-6. The retailer also offers Kasco LED-8012 Puck Lights and Kasco Universal Light Set. Fountain Mountain provides free shipping on many of its products. About Fountain Mountain: Established in the year 1999, Fountain Mountain is a leading provider of indoor and outdoor fountains from Kasco. Along with the best Kasco fountain options , the retailer offers its own line of fountains. Customers can even get a variety of fountain lights on the retailer’s online store. Additionally, Fountain Mountain sells fountain pumps for tabletop to large fountains, ponds, or waterfalls (35-14000 gallons per hour). The retailer offers solar pumps, synchronous and asynchronous fountain pumps, and inline and submersible pumps.